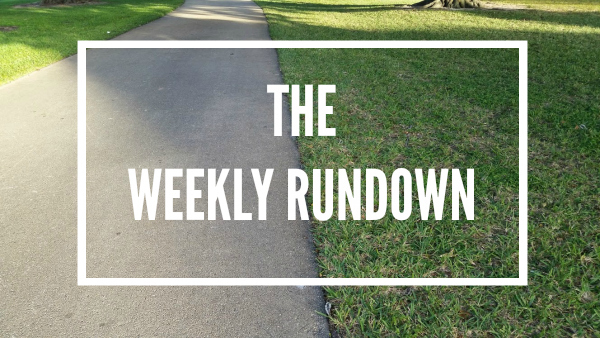 Weekly Rundown: 003 – Hello Hill Repeats! This week was a bit hectic for me, which you might have picked up on since I was absent from the blog world a couple of days. Nothing crazy happened, I was just super busy at work! Today I am looking forward to relaxing and catching up on my favorite blogs! My poor Garmin is still broken. The support team is issuing an exchange and I should have a new one soon-ish! I started the Strava app at the beginning of this run to record my time and pace, but at the end of the run it said “no runs recorded.” I have no idea what happened! Unplanned rest day. Got home from work late and a little stressed. Spent the night on the couch watching TV with Adam – The Mindy Project, Tosh and Better Call Saul. Yep, we’re total couch potatoes some nights! TOO HOT to do speedwork outside today! Four miles with middle miles run as fartlek. Hard portions were to be done at 9:45 – 10:30 pace. I ended up doing them at 10:10 – 10:30 pace. Splits: 13:51, 12:21, 12:26, 13:48. When I run outside and it’s nice and cool out I don’t have a problem hitting the 9:45 pace but I get too nervous to run that fast on the treadmill. Afterwards I did a quick-ish upper body strength workout. I was planning to make up the miles I missed on Tuesday this day, but there was an accident on the highway and it took me TWO HOURS to get home from work. By the time I walked through my front door it was 8pm and I just wasn’t interested in making up some easy miles. It just didn’t seem worth it. I hardly ever get up to run in the morning before work, so this was interesting for me. And by interesting I mean I could barely keep my eyes open during the first mile! I needed to get in the run though because I had evening plans and knew running after work wouldn’t be happening. Last week my coach asked if I would be down to try some hill repeats on the treadmill, and you know I said yes! I love trying new things when it comes to running. Since I am used to running literally at sea level with 0 hills (and just one small bridge), this beginner hill workout was a fun challenge. 30 second hill repeats were done at 10 min pace. As soon as I was done I texted Lauren to let her know I LOVED this workout and definitely want to do more hill repeat workouts in the future. I only had 9 miles on the schedule for this run, but I decided to round up to 10 miles. I have a great 10-mile loop that I really like and it felt weird to cut it short. As you can see I didn’t do any lower body strength workouts this week. I would say around Thursday is when the hip finally felt 100% back to normal. I’m glad to be feeling like myself again. I’m glad your hip feels 100% now. 🙂 I bet you are ready to get back to legs! I did legs Friday and things went well. Still not doing a lot of weight and only doing 4 exercises, but baby steps! Baby steps in the right direction! I hope things keep feeling good for you! You watch Tosh? My husband and I stumbled upon it one day and could not stop watching. It was so funny, but so wrong at the same time. Kind of like Cards Against Humanity. How do you like the new schedule – shorter mileage but more intensity? Hill repeats on the treadmill is probably one of the most difficult things I have ever done. Torture. Seriously. Nice work taking on that challenge and getting it done. I am enjoying the lower mileage, higher intensity runs more than I thought I would have! I love hill repeats. I mean, I HATE them, but I always feel really good afterward and I know they’re great for strengthening my legs and bettering my cardio. I can’t do speedwork in the heat either! I slow down a LOT in heat and speedwork in heat makes me want to vomit and pass out lol. My coach has me input all of my data into a shared Google Spreedsheet and it totals up everything for me! I love it! I’m glad your hip has calmed down and that they’re sending you a new garmin. Hope you have a great week! Thanks Sam! I hope you are recovering quickly and had a good weekend! Hope you have a calmer work week this week!! Glad your hip is feeling better even with all the running. So fun that you loved the hill repeats!!! Thanks Kim, me too! It wasn’t even really that crazy, but I had a day out of the office and I’m such a creature of habit that it totally threw me off. I need to get better at managing my life even when things aren’t routine! I hope you had a good weekend to help you unwind from that busy week. Welcome to hill repeats! They are one of my favorite workouts. I love that I get to engage different muscles and that it’s a good challenge that isn’t more speedwork. I don’t like that sometimes I run past the same people over and over again when I run back and forth up and down the same hill. I think like they must think I’m crazy! Yes! I love that hill repeats engage different muscles too. My quads definitely felt tired today during my long run. They sort of had that same feeling I get after squatting…but not quite as intense as after squat day! Haha, all of the other runners understand when they see you going up over and over again! I love doing hills and speed work. I guess that’s a remnant of my sprinting days. I’m glad to hear you enjoyed the workout. I only have one hill here, and it isn’t exactly very big, so I should really join you and take my workout to the treadmill. Great job on another good week! I didn’t know that you used to be a sprinter! That’s awesome!